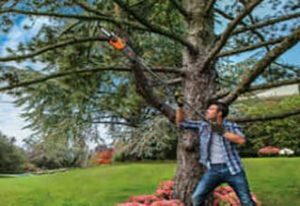 Are you on the hunt for a new chain saw? Then you have probably seen at least one Echo model! 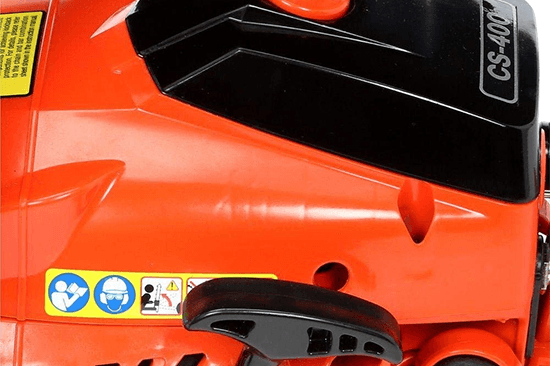 Our lawn care experts took a look at the most popular Echo Chain saws and did a full breakdown and review of each model to help you find the right model for you! Echo builds a number of chain saws which can make it hard to choose the right model! Choosing the right chainsaw might seem easy but there are many options and features to consider when making your decision. 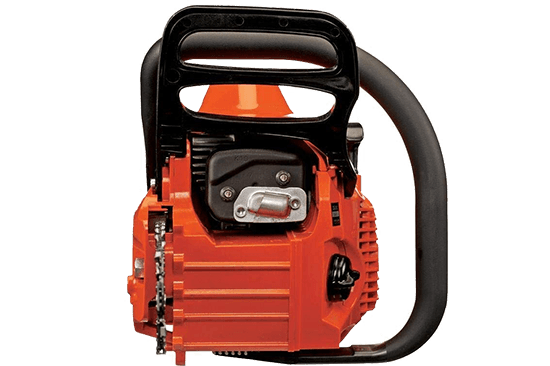 All of Echo’s chain saws are well built but it is important to have all the information on the differences between a heavy duty commercial chainsaw and one designed for light residential use! This guide is here to help break down the pro’s and con’s of all the top Echo chainsaw models. We took an in-depth look at the chains, motor, pricing and extra features and picked out a few of our favorites to help you decide! In order to build the best guide possible we took a look at almost every model of Echo Chain Saws available online and in stores. If you don’t feel like reading the full guide don’t worry, we created a shorter section highlighting only the best Chain Saws that are currently available from Echo! Want to skip to the Best Echo section, click here to jump down the page! Below is a quick list of the Best Echo Chain Saws. We build this table after reviewing each product, it includes an overall score, what is can be best used for, price, power and extra features! Starting is easy thanks to the I-30 starter! Our pick for the Best Overall Echo Chain Saw is the Echo CS-400! 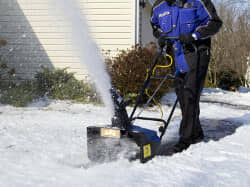 It has more than enough power to handle even the toughest trees while still being easy to use thanks to its i-30 starting system and super light weight (about 10 pounds) and affordable!. If you are looking for the best chain saw for your money you won’t find a better Echo model. 18" Cutting chain. The 18" long chain is just the right length for trimming trees and bushes in one cut. Easy Starter. Nothing is more frustrating that a tool that won't start. The i-30 Easy starter allows start up every pull, even after long periods of unuse! Some customers report problems starting and with the ignition system. 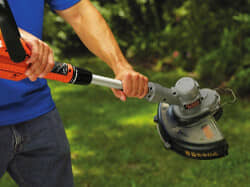 If you own a home or condo you probably do not need a super powerful chain saw with all the extra features since you will likely only use it a few times a year. If this souds like you then we recommend the Echo CS-271T! Finishing large project may take awhile due to the smaller chain and less powerful engine. Need a middle of the road chain saw for occasional use that is still light weight? We recommend the Echo CS-303T, it won’t break your back and does not sacrifice power! Need to cut hard wood? Check out the Echo CS-490! It has a powerful 50.2 cc engine that can cut right through tough woods like Ash, Beech, Birch and Oak! Stop struggling and getting your chain stuck with a less powerful motor. Not everyone needs chainsaw designed for clearing a forest. If you are on the hunt for a chain saw that is easy for ladies to safely operate then we recommend the Echo CS-370. It is adjustable, lightweight and it’s engine is not overpowering! 3 adjustable bar lengths. Switch between 14", 16" and 18"
Our team of experts knows what it takes to get commercial jobs on time and on budget! We know that requirements are different and sub par tools are unacceptable on the work site! If you have a team on site they need to have the right tools for the job! Remember, every minute of down time is costing your business money! The fast your team can down trees, trim bushes and clear land the more jobs you can schedule every week! Don’t let your business fall apart because your tools break down! For commercial work we recommend the Echo CS-590 Timber Wolf. Run a commercial landscaping or tree trimming company and need a chain saw you can trust for every day use? We recommend the Echo CS-590 Timber Wolf to get the job done right the first time! The Timber Wolf may have been our favorite, but the competition was close! Echo makes a number of saws that are excellent for every day commercial use. When looking for a new commercial chain saw it is important to pick something with enough power to cut through any material you might find on the job site without sacrificing usability! Need something with a little more juice than the Timber Wolf? The CS-501P is a great choice if you need a new chain saw for every day use. Weather it is trimming trees or cutting fire wood you can’t go wrong here! Need to take down big trees, trim branches or even cutting pallets? The CS-800P has a 80.77, 2 stroke engine and Performance Cutting System™ that let’s you cut right through even the thickest logs! This model is perfect for bucking, milling lumber and removing stumps. All of Echo’s chain saws are great tools, but it is important to pick the right one for your use case. Some models like the CS-590 are large and powerful which can make them difficult to use while others like the CS-370 are designed for smaller jobs. Prices for Echo chain saws depend on the model but are very affordable and compare well against other top name brands. With 18 different models of chain saws currently on the market you are sure to find one that you love! All of the Echo chain saws have the same orange outer body coloring with the Echo logo on the cutting bar. Each body varies slightly depending on features and functionality! Echo Chain Saws have pretty good reviews across the web but we did notice a few reoccurring issues. One of the first places we check for reviews in Consumer Reports. 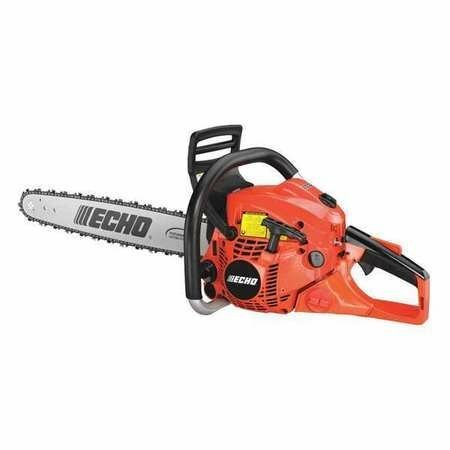 Echo Chain Saws are very highly rated on Consumer Reports and we only found 2 1 star reviews. Their report on the best chain saws is still being written but we are confident that Echo will see a few top rankings, especially for the CS-590 Timber Wolf. 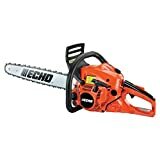 Amazon is one the best best places to buy an Echo Chain Saw online (especially if you are a prime member). Echo has great ratings on Amazon.com – you can see a full list of reviews for the most popular chain saws here. Echo has has a few complaints to the Better Business Bureau but maintains an overall A- rating! When we checked out their complaints we noticed many customer incorrectly mixing gas and oil! Ready more on their full BBB profile! Echo’s products have great reviews on their website. The lowest rating we can find at the time of writing this review was a 3.4 with most models being above 4.5! The CS-590 Timber Wolf has 558 reviews and a 4.8 out of 5 rating! At the end of the day all of the Echo chain saws are well built tools that will last for many years. If you are in the market for a powerful chain saw for commercial tree felling or something light for seasonal use around the house Echo has the perfect option for you! What is my max weight? Some models are considerably heavier than others. Make sure you know how much you can carry! 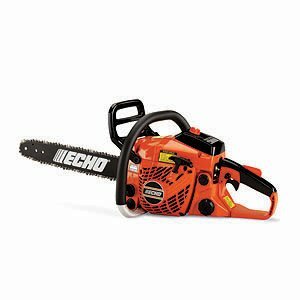 What kind of Gas do Echo Chain Saws use? Echo models run on a blend of unleaded gas. For best results use a gas to oil mixtures of 50 to 1. Make sure to always use the right blend or your may void your warranty! Are Echo Chain Saws Any Good? Echo makes great chain saw, if your not sure check their reviews! Double check all the specs and make sure to get a model designed for you! Where are Echo Chain Saws Made? Parts for Echo chain saws come from a few different places. The Yamabiko Corporation owns the brand out of Japan but the parts are manufactured in Yokosuka, Morioka, Shenzhen and Lake Zurich! How do I Start an Echo? Most Echo models start the same way. First, make sure there is gas in the engine. Second, prime the pump a few times. Finally, pull the starter and you should be ready to go! What Gas to Oil Ratio do Echos use? Echo chain saws need a gas to oil ratio of 50 to 1. Always make sure to blend your gas or you risk damaging the starter and voiding your warranty. Where I can buy an Echo model? 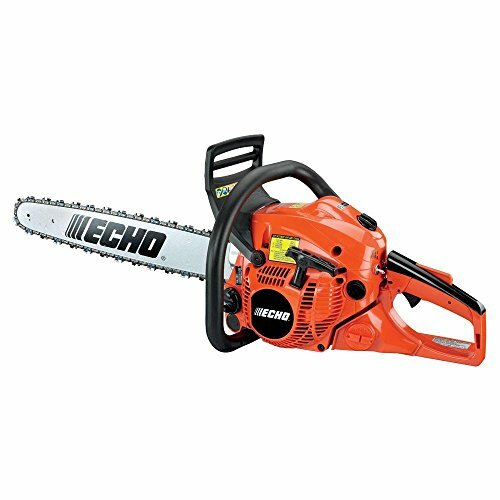 You can buy an Echo chain saw online at Amazon.com or at any of your local hardware stores. How can I replace the Chain? From time to time you will need to replace your chain. Start by removing the side panel and releasing the chain tension. Second, carefully slide the old chain off the bar. It should be easy with lots of slack. Third, loosen your tension screw (located near the base of the bar). Finally, attach your new chain and reassemble your chain saw!